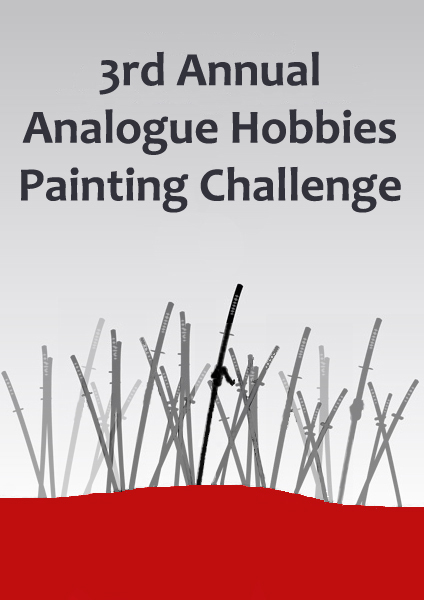 As the '3rd Annual Analogue Hobbies Painting Challenge' drew to its epic conclusion earlier this week, it seems only fitting to reflect on my small contribution to this runaway success of an idea. 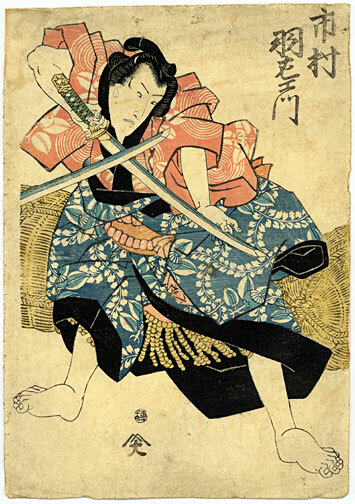 I am so delighted that I plucked up the courage to enter this year and I cannot thank my fellow Ronin enough for all their kind words of encouragement and more importantly their own magnificent contributions, some of them truly staggering in both quantity and quality. There is of course one man in particular that must be wholeheartedly acknowledged before I go any further and that is the legend that is Curtis Campbell Esq. - editor in chief of 'Analogue Hobbies'. How he managed to process all the posts, take time to reply to emails and even paint his own delightful contributions is a mystery to us all and an achievement not short of Herculean in stature. So to my personal challenge; we were asked to consider a 'par' score before we started, something to aspire to, a goal if you will. A rough calculation of what had transpired this time last year with regards to miniature painting equated to total of 420 points* so it seemed not unreasonable to me to pitch in with a 500 point 'par' score it was, after all, supposed to be a challenge! *Tally arrived at by using the marking matrix laid out in the initial briefing. I was under absolutely no illusions that I was in with a shout of winning the competition, you must remember that I had prior knowledge of how the painting colossus that is Ray Rousell, swept to glory last year with a cumulative score of 4940 points! ** However when the list of my fellow Ronins' 'par' scores was posted I harboured a secret dream of bagging a top twenty spot. It soon became clear though that the blood lust of the competition roused many a sheathed paintbrush to spring to life and self imposed targets began to tumble, while new ones were implemented almost on an daily basis; it really was wonderful to watch. All this meant that sadly I was to fall just short of my dream, finishing an honourable 23rd; I did, however, manage to reach, and even surpass, my own 'par' finishing with a thumping tally of 536! **Those cries of 'sandbagging' now just a distant murmur on a fell wind. What follows is a shameless pictorial representation of my efforts, some of which will feature more prominently in '28mm Victorian Warfare' at a later date, presented here in roughly chronological order. Highlander shown for scale and not entered in the challenge! Although the podium finishers have already been decided, and my sincere congratulations go to Chris, James and Kev, there are still some prizes up for grabs. 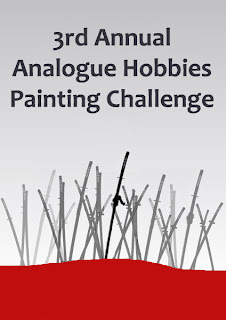 I wholeheartedly encourage you to pop over to 'Analogue Hobbies' to see for yourself the awe inspiring amount of work that was submitted over the three months, you can even cast a vote for your favourite too - if it were to be for one of my entries that would be absolutely splendid, but one should not feel under any obligation to do so. As a final aside take a look at what didn't get painted - a staggering .... points of loveliness! We were permitted to assembly, prepare and even prime our miniatures before the official start date; having grossly over estimated my production rate the question that remains is do I carry on regardless or do I put them away for next year? That's a superb collection of models you have there Michael. Congratulations on painting so much in such a short time. The one thing the competition didn't seem to take into account was painting quality, so I'd rather have your 536 points of models that 4k+ belonging to someone else. Lovely painting – I think you should finish the undercoated stuff at least. Thank you my good man and I think you are right the undercoated models should get done at least. Please carry on your work was a joy to see. Congratulations on exceeding your target. I whole heartedly laughed at the cooking pot diorama, in a week of sad news for me this raised my spirits enormously. I very much enjoyed the camels too, the detail was outstanding. Thank you Andrew, that is incredibly kind of you. Congrats on finishing 23rd Michael! You made a valiant effort indeed. I think your greyscale Samurai have got a great chance in nabbing the best unit award!!! Thank you Ray, I was chuffed to get above half way; now need to start planning for next year! You did a splendid job Sir Michael. You exceeded your target and you turned in beautiful work. My favourite of yours was a draw between the Samurai and your Cannibals with Cooking Pot. I have a feeling you may well win that Personal Choice award. Thank you Anne, they have to be my favourites too. Nothing shameless at all, you had some of the best work in the challenge! Now stop it, you'll have me blushing! Congrats on the #23 spot and very well done on surpassing your "par". the figures you have entered in the Challenge have been a joy to behold. I think you are in for a good chance of winning one of the other awards. Plenty of other fabulous work to choose from, but thank you both. Thank you my good man, but you should definitely think about entering next year. Michael, I know you've not had an easy few weeks with the occasional appearance of the "real world" interrupting your painting schedule. However, three words scream out from following your posts - Quality not Quantity! That said, congratulations to all who took part - some darned fine work all round. PS - next year, more French Marshals and more hoplites!!! That is incredibly kind of you old fruit, not sure about the French Marshals though. Just look on the painting table behind the Brontosaurus - I'm sure you might find a small back with some Foundry Johnny Crapaud inside. One of the infamous bags secreted around Awdry Towers is the struggle over the body of Leonidas - does this mean I'll have to wait nearly a year to see it painted? Curt, well done on a superb Challenge. Thank you Curt and thank you so much for organising such a wonderful challenge. Great work Michael, a stupendous performance. Really outstanding! I particularly like the 5-barrel Nordenfelt gun, but that's just my bias for Sudan pieces. It would be nice to see what you can do with the rest of the projected pieces. That elephant looks as if it has potential! Thank you so much for the kind words Edwin; I'll see if I can't bump the elephant up the painting queue. I missed the cannibal soup entry! Brilliant! That's a standout from a lovely bunch of entries, Michael. Thank you Ben, great fun to do too. Congrats Michael, Master of the seven grey scale ronins, you clearly had some of the best entries of the challenge! Hugely generous of you Nico, thank you. Thank you James, I think; £100 you say, I am so sorry! You were a very worthy challenger Michael, I'm glad you entered. Fantastic painting. Please keep up the good work - I look forward to seeing that bare metal come to life. Thank you Sir, it was great fun to take part. Quantity and quality, very impressive standard and lovely looking figures. Matt that is incredibly kind of you. Well done on the challenge and looking forward to seeing the lead mountain you on the desk painted up! Thank you Christopher, it would certainly be a relieve to have the lead pile trimmed a little. My word you produced some truly gorgeous entries mate. I still can't decide which of them I like best. The heliograph vignette is a corker but the cannibal scene is something totally unique. Congratulations, Michael. I do strongly appreciate your choice of figures to paint, and the plying of your paints in a masterful way. This blog is a lovely place to visit. Thanks much. Well done Michael, both quantity and quality achieved. Top notch Michael at least you exceeded your target for this year. Tremendous stuff, MIchael - wonderful as ever. The greyscale ronin are indeed phenomenal. Congratulations on a terrific Challenge! Well Imthink one can be proud of finishing in the top half of the Challenge. Especially if you go for quality in a competiton that where it is easier to score with weight of numbers. That being said... I think you will get a price still, since your entires included my personal top three. If others are like me, you will get some well deserved recognition! Sorry to be late but I just browsed Curt's blog for my vote and I was delighted to see your entries. Gorgeous vignettes and they really did stand out in composition, use of colour, you name it. So thanks for the excellent entries and I won't tell my favorite. I don't want to end up for dinner somewhere. Excellent news about the Cannibal Pot winning the Challengers' Choice! Well deserved! And it's nice to know that it was chosen by the other participants. I should have read to the bottom of the post before congratulating you! Peoples' Choice as well! Stunning result, with two very nice pieces.